I love nothing more than taking something home-made as a gift when invited out to supper. Quite often, taking wine or a bottle is kind of redundant as the host will have most likely shopped for everything anyway! So, our friend whom we visited tonight, really loves shortbread and brownies. And luckily for me, particularly the ones I make. So my son, Harley's choice was to take some shortbread. I bought butter and a bar of good chocolate to make it chocolate chunk and once Harley was ensconced with his best friend playing hotwheels, I set about in the kitchen. Finding no caster sugar I decided to use light muscovado sugar for the matter in hand, which turned out to be delicious! The texture and flavour was very different and the colour rich and golden. We liked it so here is the recipe! I use a tin that I don't need to grease, but you may need to if you are unsure of yours. Preheat the oven to 180°C/gas mark 4.get a swiss roll tin ready. place the butter, flour and sugar in to a large bowl and rub in using your fingertips until all of the butter has been rubbed in to the flour. This is not so easy as a scone or pastry, say as the ratio of butter to flour is high. Once all of the lumps of butter has been rubbed in the mixture will start clumping together. Scatter in the chocolate at this stage and then mix it through the crumbly dough. Spread the dough evenly over the tin and then press it down hard with the heel of your hand, evenly as you can and making sure you go around the edges with your finger tips. Bake for 20-25 minutes until golden then remove from the oven and sprinkle a little more sugar. Cut in to small pieces about 3cm square and leave to cool. Wrap in a clear bag and tie with some coloured raffia or ribbon. Pass on to your friends with pride! It certainly has been a while..... life has been hectic over these past summer months! The school holiday has flashed past and I have felt I have not spent enough time doing all of the things I had planned to do with Harley. But really I am not grumbling! I must be doing something right to be so busy with work. 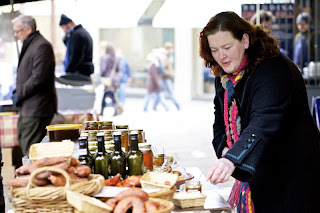 I am still writing recipes for Borough Market and copy for their magazine, too, called Market Life. I really like writing for them, amid all of controversy, as the producers really believe in what they are selling which is evident walking through the arches of Borough. I have my regular work for Waitrose which I have been doing for many years now and then I have a few other regular clients like Roddas and Kallo . But over the summer John and myself have been working on a new baking magazine. I have written some of the recipes but the bulk of the work has been photographing all of the recipes within the magazine which has been a brilliant undertaking. Sourcing Christmas props has been fun yet challenging and we have been getting in the Christmas spirit. Something I find particularly irksome though, are the quality of the recipes. There are other professional writers on board but the quality of their work is really terrible. Recipes that don't work, missed ingredients and quite frankly, recipes that are not nice. I know that food is often based on the fact that beauty is in the eye of the beholder but some of these recipes leave you cold...... What I really find astonishing is that most of these people present a client with substandard recipes and want to be paid. I cant imagine they have any pride in their work. When the recipe is submitted it comes with a photo. Well it makes you wonder whether people can actually cook. One of the recipes we have photographed has been giving us grief for weeks. We are going to re-shoot it as the photo is frankly not representative of the recipe. We are trying to iron out these issues. Anyway, when the magazine comes out, the recipes will work. They have been tested and sorted out! So, please, if you are going to write a recipe and don't want the food stylist to get ratty trying to make it work, then do it properly! Last night I spent an interesting and utterly addictive hour looking at stock photography. I really could not believe how awful most of it is! My photographer husband has recently done some talks to a design company about the benefits of having bespoke pictures for food and after looking at stocks ones I can clearly see why! It has kind of been a mystery to me -as a recipe writer and food stylist - as to why a magazine, for instance, would use a stock picture that does not quite equate to the recipe as it is not a true representation of the recipe for starters. But really it is not cost effective at all, is it? A photographer and home economist can get through a good 8-10 different shots depending on the styling. Those pictures can then be used for anything for as long as they are needed. No time limit or even stipulation as to where they can be used. From those shots there will be more than 1 picture, too. So a day's shoot could produce dozens of pictures. The level of photography in a lot of these pictures is flat and contains no flair or creativity. The lighting can be wrong, shadows in many of the wrong places! And the food styling is dire. I wonder if the food stylist has any pride or even skill? Can these photographers call themselves professional or are they just amateurs hoping to make a bit of cash on the side? It is so easy nowadays to buy a professional camera and with all the money kicking around many people are thinking they can just jump on the band wagon. I am happy to say, though, that out of the dozens of pictures I stared open mouthed at, not one had actually been downloaded! Maybe designers have sense after all! It makes me feel quite ratty when I hear people saying that good food is wasted on children. I was watching a programme not so long ago and the person cooking - I sadly cannot recall who - gave their opinion that children don't appreciate good ingredients and what they were making should be saved for adult consumption only. This evening I cooked some fish which was most certainly not my best attempt at supper but I realised at 6oclock that I needed to cook as it is a school night so the food needed to be on the table at 6.30 ish. And oops, nothing in the fridge either! So I roasted some fish from the freezer only to be met with distaste at the fact it was too dry and did not taste of much. These comments came not from my husband but Harley, aged 8! Admittedly, I have never deprived Harley of anything. I have always given him what we eat and tried to teach him good values that should surround food. It makes me feel proud when he is critical and analytical of his food. I really want Harley to understand and know what he is eating. He hates the smell of Macdonalds, wont eat ketchup and is not bothered that I wont let him have crisps in his lunchbox. I can hear the chatter now of you thinking that it is all down to parental influence and I think you are right. But how do all children learn anything? Through adults who lead by example. I would most definitely want Harley to prefer Green and Blacks to Cadbury chocolate, say. At least then I know his taste buds are in perfect working order! First off, sorry to have been so long away! That really is rather lax. Things have been steady since the new year began with writing taking the forefront in my work. Last year, I was really lucky to have been asked by Borough Market in London to write a series of recipes for them. Recipes for their magazine and website too, bringing together the traders with a perfect marriage of ingredients and personalities. Now, living in Wiltshire presents a whole different load of experiences to living in London. I am comfortable amongst the rolling hills and rarely venture into the big smoke for a variety of reasons. But a visit to the market to meet the traders was compulsory so I got myself together and made the trip. Sadly it left me with withdrawal symptoms when I left it behind! John came with me along with his camera and we spent the day being guided around the most atmospheric and wondrous food market imaginable. Not only were there people selling street food but there were farmers, small producers and smiling faces too. The market is situated under old railway arches just next to the London Bridge tube station and encapsulates anyone's love of food into one space. I really would love to be able to shop there every day, and I am sure many do. We started off by eating some amazing seafood at Shellseekers. Hand dived oysters and scallops either to take home or eat there and then. I opted for the scallops, cooked with a little bacon and served on a crisp salad in a scallop shell. mmmmmmm...! We then tried cider from Newforest Cider company, cheese from countless delicious stalls, walnut oil from Olivology and the list goes on. As we meandered around the market, it really became evident that there is a genuine love and passion emanating from the traders. This really comes through when you eat their wares. Something you can't get from a supermarket. So my inspiration for the recipes is never ending. Ideas keep swimming round my head and I can taste and smell the market each time I recall the visit. It's so exciting, realising the ideas gleaned from the market into a dish. And then knowing the recipes are accessible and they work! Check them out on the website! So get down there if you can. But you definitely wont want to leave! ps. 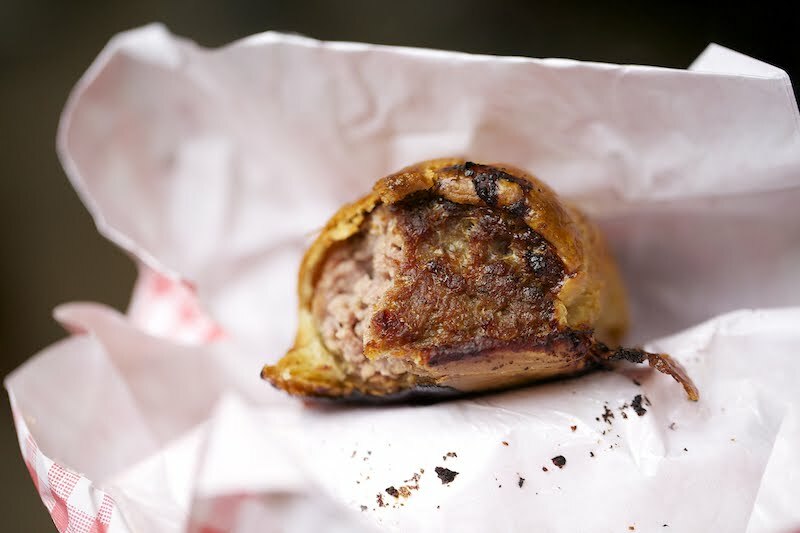 go to the ginger pig for one of their sausage rolls! Christmas is a magical time of the year, not only for the spirit of the season but also the food and fun. Preparing for it is half of the fun and increases the anticipation somewhat! I have just made my mincemeat in readiness and what I love about it is that a seed of an idea can be recreated into a flavourful creation without a recipe. Just an idea of perfect friendship and balance can end up in jars of home-made heaven. It is great for gifts too, just a tag, no need for wrapping, the contents is beautiful and speaks for itself. From as early as the fifteenth century, mincemeat has been made. But traditionally it would have been with meat. Nowadays, just the beef suet remains of this relic of our past cookery. Meat and fruit were popular during Medieval times and spices too, with spices being used by the rich to show wealth, hence these flavours being turned into a pie. Our tastes have come a fair distance in some respects but still we turn our backs on fusion food and look to our past. The kind of ingredients I like to add to my mincemeat are dried cranberries, cherries and perhaps even blueberries. Fresh fruit will ferment so the idea of gently cooking the mincemeat for a couple of hours is a good one. So to get you on your way, dig around in your cupboard and bring out all of your dried fruits. Pick the ones you would like to combine then add into a large bowl in what ever ratio you like. Nuts are good too, so choose those if you like. Add some suet, beef or vegetable around 1 to 5. Lemon and orange zest and juice are good, then sugar to taste. Light brown or Light muscovado work well. Lastly, add some spice. Mixed will do but invest in a good one. 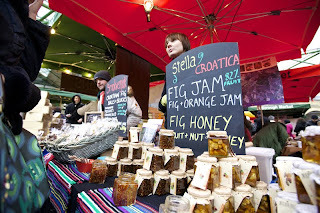 I bought some from an amazing stall in Borough Market not too long ago. The difference was astounding. Fragrant and heady. Macerate for a day then warm in a low oven for 2 hours. This will melt the suet and coat everything, stopping the mincemeats need to run away out of the jar. pack whilst still warm into warm sterilised jars, seal, then sit back and enjoy the moment!